Imagine, if you could fold your computer screen like paper. Would we then ever need paper at all? 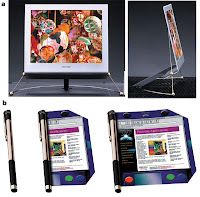 For the past many years there has been a lot of work going along on foldable displays and other things like that with limited success. 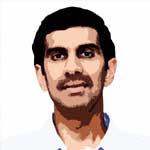 The good news is that there is an Indian researcher at Bell Labs is not only working on the prospect of foldable screens, but is seeing frution of his work. He was one of the TR35 winners, and profiling him was a challenge for me. Chemistry was always something that I was mighty uncomfortable with, in fact, after mathematics, if there is anything that I really disliked, it would be chemistry. I could never understand why we roted those weird molecular diagrams of ethyl alcohol or Benzene. So I was literally grappling with Organic Electronics, much work went into understanding the basics first. And by the time I was done with the story, I had developed a healthy respect for chemistry in general and Organic Electronics in specific. Here goes the fourth part of the 6 TR35 series. Ashok Maliakal for the past three years has been toiling at ways to revolutionize the computing world with the use of organic electronics. Going by the signs, it does not seem to be as far-fetched, as it may sound. Much as we dislike it, plastic or polymer has nevertheless permeated everything in our lives. This organic substance seems to be fairly ubiquitous from white goods to textiles; polymer is an undisputed king. While it rules on the macro level, somehow it has not made headway on the nano scale. That all could very well change with the emergence of organic electronics. Revolution seems like understatement, when one refers to the change that has occurred in the computing industry. Everything has dramatically and drastically changed; the processing power has increased hundred times over, applications have changed, newer devices have emerged. The only thing that has remained more or less untouched is the display device, or the unassuming monitor. To be fair, the green monitor screen has been replaced by a much vibrant color screen; much slimmer and sleeker. In spite of these cosmetic changes, monitors have remained bulky and big. Take the case of a laptop display screen, in all these years; it has remained much as it was. There is a ray of hope breaking on the horizon. A hope that in the future, display screens would not be as bulky as they are, they would not be limited to current materials, etc. All in all, the displays will be not only be sleeker but also more flexible in nature. A researcher at Bell Laboraties in the U.S. is earnestly working at making that dream come true and his name is Ashok Maliakal. He is a researcher in organic electronics. Organic electronics (plastic electronics) is basically a branch of electronics that deals with conductive polymers, or plastics. The term ‘organic’ is used as the molecules in the polymer are carbon-based, like they are in every living or organic thing. Organic electronics differs from traditional electronics as the latter relies on inorganic conductors such as copper or silicon. “Since my doctoral work, I’ve been interested in how molecular structure affects a materials properties. Organic electronics is a wonderful place to explore these interactions,” says Maliakal. The singular biggest application of organic electronics can be seen in what is popularly termed as ‘printed electronics’. This is an emerging technology that talks about printing of electronics on common media such as paper, plastic, and textile using current printing processes, just like we print a newspaper for instance. This printing utilizes common press equipment in the graphics arts industry, such as screen-printing, flexography, gravure, and offset lithography. Though, instead of the regular printing inks, families of electrically functional electronic inks are used to print active devices, such as thin film transistors, or RFID tags. Once, printing electronics picks up, there is going to be an explosion of low-cost electronics useful for applications not typically associated with conventional (i.e., silicon-based) electronics, such as flexible displays, smart labels, animated posters, and active clothing. “Conventional ways of creating electronic circuitry are not only complicated but costly as well, with printed electronics there would be large scale upsurge in low cost devices. It would be quite dramatic,” says Maliakal. One of the biggest application of printing electronics could be in the production of flexible electronic displays. As the current displays are quite rigid in nature, printed electronics could help in the invention of a low-cost, foldable, bendable display devices that can be mass produced for applications such as large area sensor networks, lightweight viewing screens for various handheld devices like PDAs, etc. Philips last year displayed a device with a rollable display known as Readius, that is fairly similar in design but quite different in the way it is manufactured. “My work could help enable a practical printing process for generating flexible display technologies,” says Maliakal. Maliakal´s work at Bell Labs focuses on the design and development of nano-structured organic and hybrid materials for advanced electronic applications. His research is paving the way for design and development of functional electronic materials that will lead to new, fully integrated devices and sub-systems, as well as low-cost fabrication methodologies and increased functionality. Maliakal has made a breakthrough in the development of a new printable hybrid organic-inorganic material that formed good films with triple the permittivity of known polymers. “In it, I have mixed the certain properties of polymers (plastic) with that of titanium dioxide (ceramic) to achieve the new functional nano particle,” he says. The beauty of Malaikal’s invention is that it not only allows inventive usage but at much lesser power consumption. “Prototype circuits made with the material operate at one-third the voltage of those made with the polymer alone. That could mean displays that consume a lot less power, “ he adds. Maliakal is a first generation American, as his parents had migrated from India a few decades back. He currently holds five patents awarded or pending and has published more than 16 papers. He completed his Bachelor´s degree in Chemistry from Cornell University and a Ph.D. in Organic Chemistry from Columbia University. His interests range from going out with family (wife and son) to music and running. He admits to occasionally see a Hindi movie, now and then. Maliakal also does not believe in astrology or sun signs and would not share his birthdate, as one could discern his sun sign and would judge him accordingly. On a lighter note, that seems a rather obstinate trait; now which sign could that be, any guesses?